Our good friends Dave and Grainne have been droning on about South Africa for years. Telling us about the incredible scenery and the amazing food. To shut them up we decided to go and see what all the fuss was about. Getting to South Africa is pretty easy and best of all there is barely any time difference. We elected (for budgetary reasons) to fly into Johannesburg and then hop over to Port Elizabeth on a separate flight. Which sounds fine, but we weren’t aware of the farcical disarray that lay in wait for us at Johannesburg airport. The queue for immigration control was beyond anything we have encountered before. The actual form queuing took place was in a backwards and forwards, zig-zag fashion that looked to go on forever. But this area couldn’t cope with the mass of people. So in order to reach the endless queue we had to first run the gauntlet of the evolutionary stages of a massive queue to get into the formal queue. A British traveller’s worst nightmare. Imagine a forty lane motorway which suddenly has to filter down to one lane. We, along with a few other Brits instinctively and valiantly tried to form an orderly queue. The other 95% of the immense crowd flowed either side of us, shoving and pushing each other in their quest to reach the promised land and earn the right to stand in a very long queue for hours. Normally in such situations I have a big rucksack on my back to “accidentally” meat out some justice. But on this occasion I had to make do with “accidentally” standing on the heels of the worst offenders. A while later, after much tutting and passive aggression, we entered the formal queue and this was the view. And this is where we first came to realise that South Africans can only do one thing quickly. And it isn’t checking passports. It is a terrible photograph, but I was under immense stress. What you looking at there are a load of people who queue jumped me. After we got into South Africa things went pretty smoothly. We fell for, once again, the classic scam played on newcomers. The helpful person. He guided us to a sign I had already seen and then demanded payment. Thankfully, although we always fall for this ruse, we no longer feel the need to pay. He laid his hard-luck story on the line whilst we walked off. In the absence of a better option, we then had a Wimpy. The once mighty Wimpy is barely seen in the UK now so it was a surprise to find that Wimpy is thriving in South Africa. So much so that it has its headquarters in Johannesburg and has over 500 restaurants within the country. No sign of that weird saveloy burger though. We then took the next flight, picked up a car and drove from Port Elizabeth to Addo Elephant Park. When most people think of South Africa they picture the animals – the Big 5. The national parks around Johannesburg are the most popular for safari and game drives but we wanted to explore the southern coast of the East and West Cape which is why we started our adventure at the Addo Elephant Park just outside of Port Elizabeth. Addo is the third largest conservation park in South Africa. Technically the park offers the chance for visitors to see what they describe as the “big 7”. That’s elephants, lions, rhinos, leopards and buffalo, with whales and great white sharks down on the coastal part of the park that we didn’t visit. In fact the main part of the park we visited is mainly an elephant reserve. The park has over 600 of them, so after 2 hours of driving around seeing nothing but tortoise and warthog, we started to think we might be in the wrong place. Eventually though, we arrived at a watering hole and saw our first elephant. I hadn’t seen an African elephant up close since I was a kid – I don’t like zoos – and I had forgotten how big and majestic they are. Other cars had quietly pulled up and we all sat watching the mighty beast drink. My view was a little restricted from the passenger seat though. I reached across Claire, who was in the driver’s seat, to get a photo, steadying my camera on the steering wheel. Or to be more accurate, I leant on the horn. For a good three seconds, until I realised that the idiot was me. I shut my eyes in despair, and in my mind the elephant ran for cover. This is that very photograph. Not bad considering the circumstances. Then I opened my eyes. Incredibly the elephant didn’t appear to care and carried on drinking regardless. We assumed that the other 599 elephants were hiding and agreed that we were happy to have seen an elephant in the “wild”. Shortly afterwards, having guessed that they hang around near water we stumbled across loads of them, as well as zebra and buffalo. It was a truly awesome day. The park came to be when a group of like minded people decided that elephants needed to be protected. The elephants had a habit of destroying farms so people killed them. Over time the park grew and grew. An early problem was keeping elephants inside the park itself, as they like to travel great distances and don’t think twice about smashing down fences and buildings. The solution turned out to be grapefruits and oranges. When the park started feeding the elephants with these they became addicted and stopped wandering far from the park buildings. Though in due course they became so addicted they were more than willing to smash down a fence or a building to get to the fruit. Now citrus fruit is banned in the park for fear that it might send the elephants crazy again. 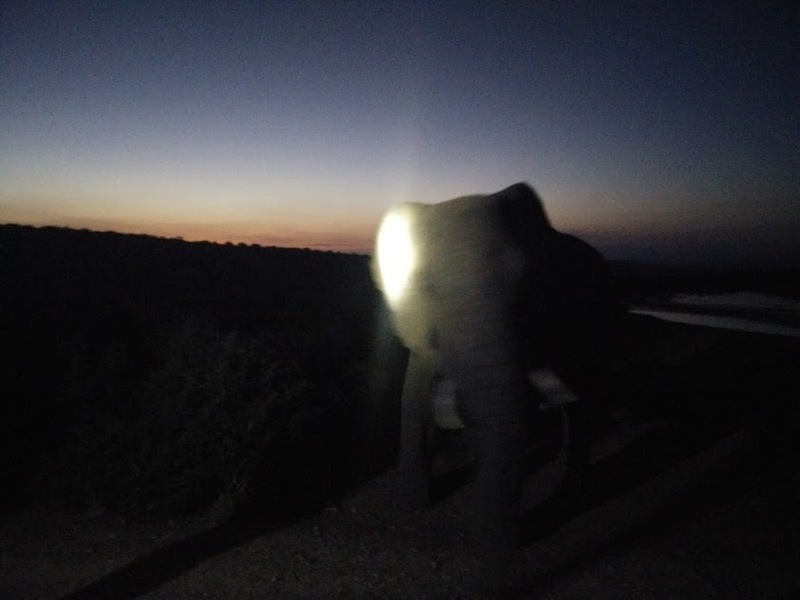 In the evening we decided to go on an organised night safari. The group turned out to be a selection of Germans and Scandawegians. The guide asked what we had seen in the park already and in short order, and rather strangely, was slating all Europeans for not knowing the difference between a tortoise and a turtle. Our attempts to distance ourselves from this strange generalisation was drowned out by the sound of German and various Scandawegians translating the difference between a turtle and tortoise to each other. We’ve been on a lot of tours and excursions. We know the tricks. So when the vehicle immediately set off down a service road and within 2 minutes “stumbled upon” two lions I was sceptical. Especially as every other night safari was descending upon this one spot, which was right next to the fence and some buildings. “Wow! This is amazing! You are so lucky – there are only 10 lions in the whole (1,600 square km) park!” the guide exclaimed as he dazzled the poor lions with a huge spotlight. But it was still an amazing moment, The lions, 2 brothers, sat and watched us, completely undeterred by the commotion. Probably because they sleep at this same spot every night and they always get dazzled by a spotlight for an hour or two before bedtime. Shortly afterwards we found an elephant (at a watering hole) and it came so close to the truck that we could have touched it. Another totally amazing moment. I may have rushed the photograph though. Note that the guide was helpfully illuminating the immense beast so we could see it, at a range of about 5 metres. Then, to prove my theory that the whole tour was based around the two lions who always sleep in the same place, the truck drove around the park with the guide shining his light at the bushes and occasionally shouting out things like “that’s an impala” or “yesterday we saw 3 lions here”. Addo was a fantastic start to the trip. To see happy elephants in such an environment was an honour and the scenery was breathtakingly beautiful. After two nights at Addo we left to set off on the rest of our trip. Our final destination was to be Cape Town 2 weeks later. If you are fan of our previous adventures as described in this here blog, you will be disappointed to hear that all accommodation was already booked. And we hired a car, so no buses, trains or rowing boats were needed. But fear not, because the food was often delicious and ugly, the sea sloped and our satnav was again christened “Shatnav”.